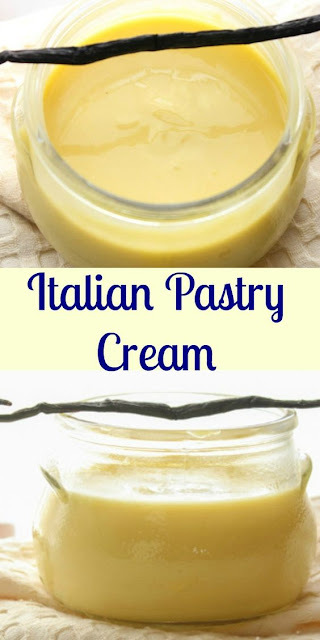 I bake all the time - almost every day but I don't often make pastry cream. The only reason I made this recipe was because I had a lot of egg yolks leftover from a cake I had made. This recipe is very simple and rather quick to make. I followed all directions except that I added an extra splash of vanilla at the end. My pastry cream is in a bowl chilling in the refrigerator right now with plastic wrap on top. After I had cooked it, I left it in the pan for a bit so I would not be putting hot pudding directly into the cold fridge but it quickly started developing a skin. So make sure you get that plastic on there quickly. I think I might have to push it through a sieve before I use it. It's certainly not lumpy but I think it could probably be a bit smoother. The vanilla beans are a nice touch - flavor wise and visually. It's nice to see those little dark specks in the cream. I used whole milk and I think it might even be better if you were to use half n half. I can't imagine that 2%, 1% or especially nonfat would be very good. Maybe 2% but not less than that. The pastry cream really benefits from the fat that the milk adds and also the butter. Don't leave out the butter. I can eat this right off the spoon and it's certainly delicious but I don't think it's quite sweet enough to pass as pudding. As a filling it would be great. I'm not sure what I'm going to use it for yet. Maybe as a filling for a Boston cream pie?